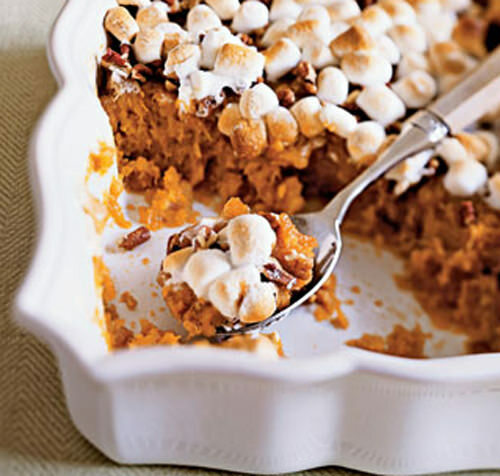 Sweet potato casserole – This dish you just can`t miss or leave unprepared especially if you belong to the group of people who are fond of sweet potatoes. This will make a great side dish to your festive dinner and will make all your guests get astonished. Preheat the oven to 400 degrees and we start with the filling. Roast the potatoes on a foil-lined baking sheet until it gets soft. It will take about an hour. Cut the potatoes in half and let it cool a little. Then peel them and mash with a masher or simply with a fork. In a large bowl mix the mashed potatoes with all the other ingredients: milk, eggs, sugar, vanilla, nutmeg and cinnamon. Beat it well until smooth. Grease the casserole dish and pour the potatoes into it. Now let`s turn to the topping. Combine the flour with brown sugar in a blender or with a spoon. Then cut the butter into it and stir to receive coarse crumbs. Add the walnuts and spread the mixture over the potatoes. Bake it for 40 minutes until it gets golden brown.